The appeal of hand-dyed yarns is that each skein is an individual, contributing to a one-of-a-kind garment. 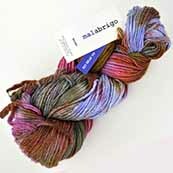 Malabrio Worsted is kettle-dyed in small batches so no two skeins are alike. The colors are variegated, combining two or more colors in gorgeous combinations. This is a wool yarn, but a very, very soft one, since the fine diameter and long staple length of the Merino fiber makes it the softest wool there is. If you are planning a project that would benefit from unique colors and warm, soft yarn, plan it with Malabrigo Worsted.